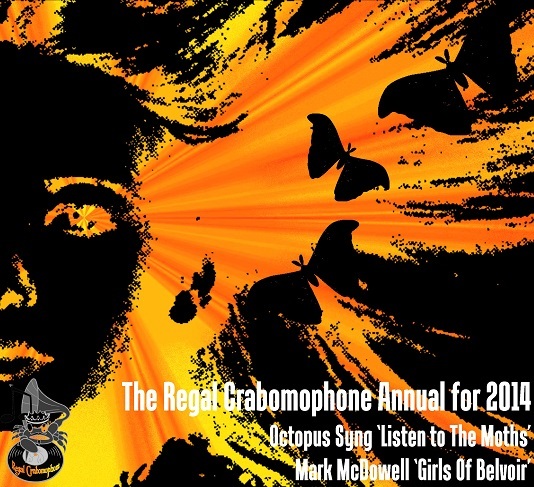 Regal Crabomophone is the Fruits der Mer Records sub-label created to release both original songs and covers, and like the Fruits de Mer annuals, this one finds a home for songs that FdM Keith could fit in anywhere else during the year. On this year’s annual we’re treated to two tasty originals. Mark McDowell is a UK based musician I don’t think I’ve heard before. His Girls Of Belvoir is a beauty of a lilting folk-pop-psych song with woodwinds and violin, pulsating phased guitar, and sporadic guitar leads that add an edge to this otherwise dreamy song. I need to explore more of Mark’s music. Octopus Syng was for a long time a solo project of Finnish musician Jaire, though I think he may have taken on more members now. His Listen With The Moths is a perfect companion to Mark McDowell’s song. It starts off as a gentle but rhythmic folky brand of 60s inspired psychedelia. But after a few minutes the music blasts off into a heavier rocking but trippily angelic psych tune. I love the vocal harmonies which are gorgeously retro 60s. And at nearly 8 minutes Jaire really stretches out and we get some scrumptious psychy guitar leads.